Despite this I feel I've learned enough of Moho to compare it to CTA3 to help you determine which application may be suited to your needs. What Type of Animation Are They Suited To? 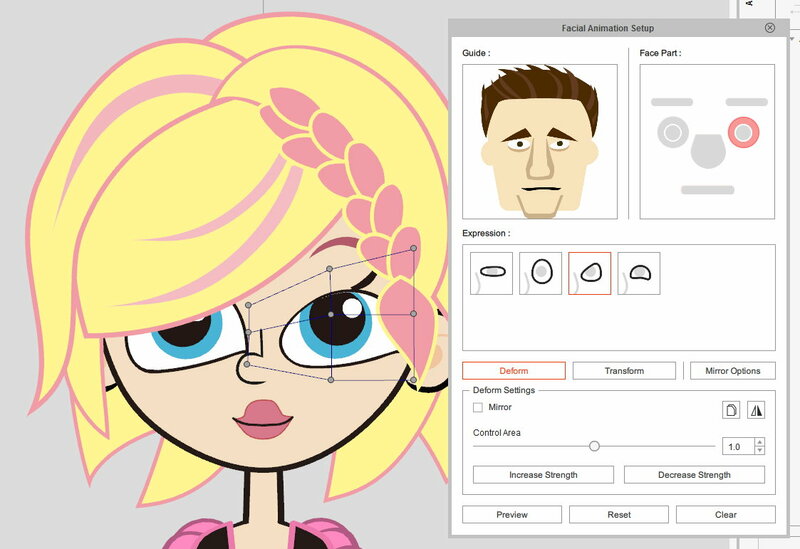 Both applications excel at 2D, puppet style, character animation and 2D motion graphics. Moho has some additional ability to animate 3D objects and 3D character rigs but 3D is really included to compliment and enhance your 2D animation with 3D elements. If you're looking specifically for frame by frame, hand drawn animation then neither of these applications are really suited to that style. Moho has vector drawing tools to help create finished hand drawn animation but isn't good for drawing initial roughs. CTA3 can handle frame by frame animation through sprite swapping but uses this ability mainly for animating detailed items like hands and faces. What Version Should You Buy? Both CTA3 and Moho are sold in different versions. If you're a complete animation beginner and aren't ready to invest too much, you might want to consider the lower costing CTA3 Standard or Pro. With Moho you might consider the Debut version. Be aware that these cheaper versions remove some of the advanced features of the full versions (CTA3 Pipeline and Moho Studio Pro). I've seen many people complain that it would have been more cost effective to purchase the full software initially than pay the additional price to upgrade to the full version. My recommendation, if you know you're serious about animation and can afford the full versions, then buy them. You'll get the full experience of the software and will never watch a video tutorial only to discover that feature isn't in your version. Both applications offer free trials so make the most of those before you buy. I wouldn't recommend downloading them at the same time, there's just too much to learn. Trial them one after the other. This comparison is based on the full versions of each application. Which One is Easier to Learn? An initial comparison of CTA3's user interface (UI) to Moho 12 reveals that CTA3's is much less intimidating with fewer tools and settings initially onscreen. CTA3's UI remains fairly constant with tools grayed out if they aren't appropriate to the current selection on the stage. Fly-out hints appear for most tools if you mouse over them. Moho's tool menu changes quite a bit with different tools coming and going based on what is selected on the stage. Moho has fly-out tool hints but also includes a hint bar, under the settings menu bar that further details how the currently selected tool is used. Both applications feature comprehensive, written user manuals (available through their Help menus). You'll also find many video tutorials, created by each company, to help you learn, however both companies could use an online video tutorial link from their application's help menu that is a direct step by step video guide to learning the software (videos that logically progress and gradually introduce you to the more advanced features). For some reason both companies focus on explaining their software's newest features and forget that not everyone is upgrading. New users tend to have to sort through the tutorial videos to find what they need. Overall CTA3 is the easiest to learn by virtue of the fact there is less to learn and you can get through the basics much quicker. Further to that, CTA3's content library (even if you just settle for what comes with the application) will have you animating much quicker. Predefined content, motions and auto lip syncing make getting your first test animations up and running a much simpler process. Moho does ship with some demo content that you can make use of (and you can buy content packs) but generally the process of animating is more detailed and intricate - giving you greater control but making it more time consuming to master the basics. 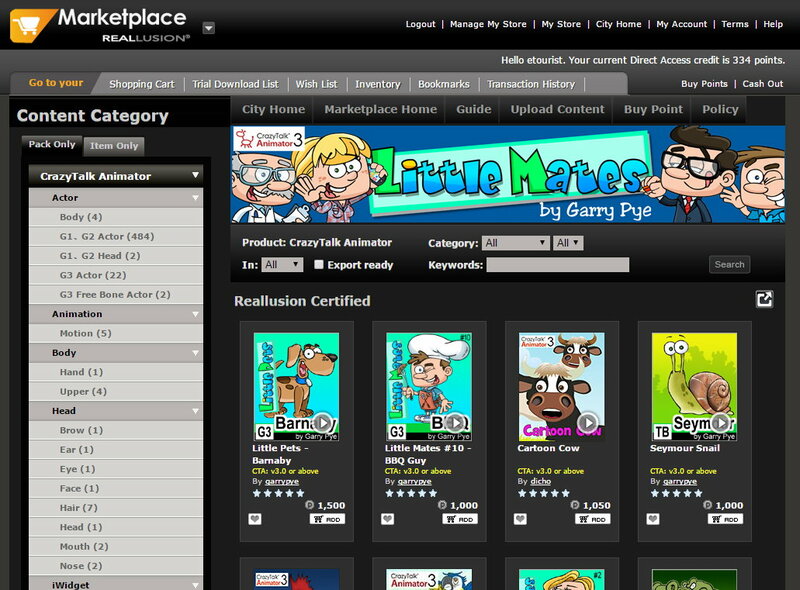 Both CTA3 and Moho allow you to animate with pre-made content that you can either purchase directly through each company's online stores or through their respective, user generated, market places. 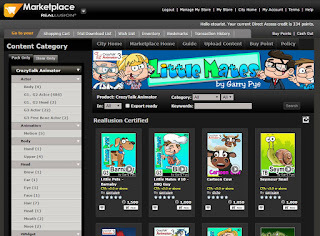 Reallusion's Content Store and Content Marketplace is easy to find through links directly from the application's Help Menu. I had to do some digging to discover a link to Smith Micro's Content Paradise Market Place from within their Online Store (which is also has a link from the application's Help menu). Both applications include character creation/composer tools where you can build custom characters using existing assets you already have. I personally prefer CTA3's character composer as it really draws on any available content you have in your library. Moho's character composer seems to limit you to a particular drawing style. Moho's creator also includes a random character generator feature that I found resulted in characters so garish and awkward they were more laughable than useful. Creating animations from your own artwork is very possible with both applications though, at minimum, you will need a drawing application that can export to transparent PNG and JPG image file formats. 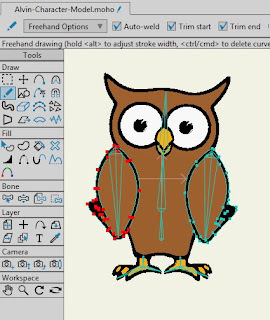 Moho's vector drawing tools allow you to trace all your artwork into vectors right within the application. It even includes a handy, auto-trace tool that works reasonably well. CTA3 has support for vector art as .SWF files but you'll need vector illustration software that can export in this format. 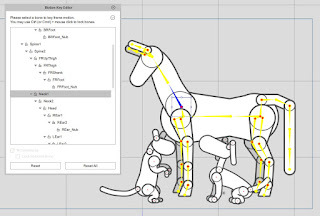 2D puppet animation is built on manipulating character bone rigs. Any talk about ease of character creation from your own character designs comes down to how easy is it to rig your characters with a bone rig. Moho's bone rigging system is incredibly advanced and flexible in application. You can use it to rig characters of any size or shape. If you can dream it in 2D then Moho's bone rigging system can make it move exactly how you want. You can even add bone switches and levers to manipulate bones indirectly. All this comes with the price of a fairly steep learning curve. found in Moho's Project Sample Library titled CK Crustacea. 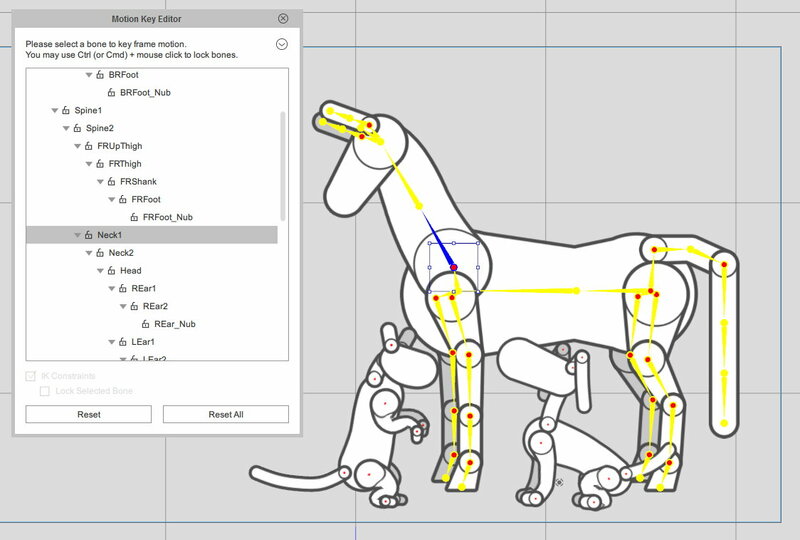 CTA3 with its new G3 freebone character rigs will also effectively let you rig almost any 2D character art you can imagine using a similar bone rigging system to Moho but with a much simpler and easier to learn implementation. featuring Cats, Dogs and Horses. On top of this you can build your characters around specific G3 character templates for humans, cats, dogs and horses. This allows your characters to be animated with predefined motions from your motion library and also makes them compatible with CTA3's direct puppet facial animation system too (a process that allows you to directly record your character moving in real time). G3 characters in CTA3 are relatively easy to rig. Once you have all your artwork ready, putting together a basic rig can be done in less than an hour. 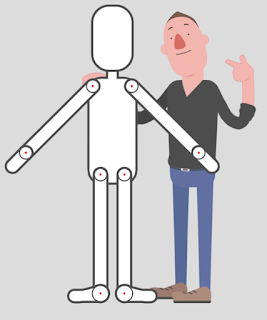 A full character rig with switchable hand and facial sprites will take longer but it's not that difficult to learn. Unique to CTA3 is its G2 plus (bipedal only) characters, which simulate 3D movement in a 2D environment, and makes use of the new facial morph, face animation system of G3 characters. In action these characters are quite impressive and can even be animated using 3D imotions from iClone however, creating a G2 character comes with a very steep learning curve and is extremely time consuming. If G2 characters sound like an attractive option be sure to purchase the Pipeline version of CTA3 which has tools to make the creation process a touch easier and quicker. clip was key framed from scratch in CrazyTalk Animator. CTA3 is specifically designed to speed up the actual animation process. Whilst you can key frame every little movement from scratch a lot of time and effort can be saved using the predefined motion libraries and puppet animation tools. Block out motion sequences using combinations of library motions then refine them to suit your exact needs. Create motions from scratch, save them out and transfer them to other characters. Create action menus for your characters containing often used actions (and perform motions that can even include the character's voice track). Lip syncing is as simple as loading in a voice audio file into your character and CTA3 does the rest. It's pretty good too but, if your character's mouth movements don't quite look right it's easy enough to refine with the lips editor. In this latest release, CTA3 introduced elastic motions for props, making it easy to add cartoon effects like squash and stretch to your motion graphics simply by drag'n'dropping the desired effect onto your prop. The majority of CTA3's animation can be done using point, drag and click motions of your mouse or track pad combined with keyboard short cuts. In contrast, I've been learning Moho's animation tools for quite some time, completing well over 30-40 video tutorials... I've heard you can import and export motion files with Moho 12 (it's listed as a new feature) but I've yet to be shown how and have no idea where to start. So far all of the character animation I've done has been key framed from scratch. applied in seconds to give animations a whole new look. Moho does feature automatic lip syncing that is a little easier to set up on a custom character compared to CTA3 however CTA3's facial deformation animation system gives your mouth sprites considerably more range of movement and expression. Moho could probably match and even surpass CTA3's facial animation system but, in doing so, its set up becomes much more complex and time consuming. As far as motion graphics go I would say Moho is on par with CTA3 but doesn't have quite the ease of use that elastic motions bring to the table. That said, CTA3 has no physics or particle animation support, nor does it have Moho's animated effects for layers such as shadows, 3D shadows and shading. Both applications have the ability to create a 3D parallax effect (multi-layer planes) by being able to places items nearer or further away from the camera. Moho takes this a step further by being able to rotate 2D objects around the Z plane (i.e. tilt 2D images towards or away from the camera). 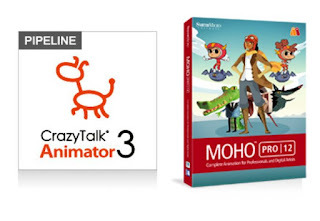 Is CrazyTalk Animator 3 Enough or Should I buy Moho 12? CrazyTalk Animator 3 has yet to be proven as a serious 2D animation studio (I'm not aware of any major animation studios using it to create their shows). It has impressive features, many of which are unique to the application but it's still a relatively new player. In it's favor is ease of use, time saving motion libraries (including elastic motions) and its easier to learn bone rigging and facial distortion animation systems. The quality of the animation produced is mostly determined by the skill of the animator as there is nothing here to prevent you from producing professional quality animations. It does lack many of the advanced visual and style effects found in Moho but this isn't an issue if you're not doing anything complex enough to need them. Elastic motions are such a nice, new addition to version 3 that, if motion graphics or animated explainer videos is your thing, these are going to really bring your images alive easily and quickly. 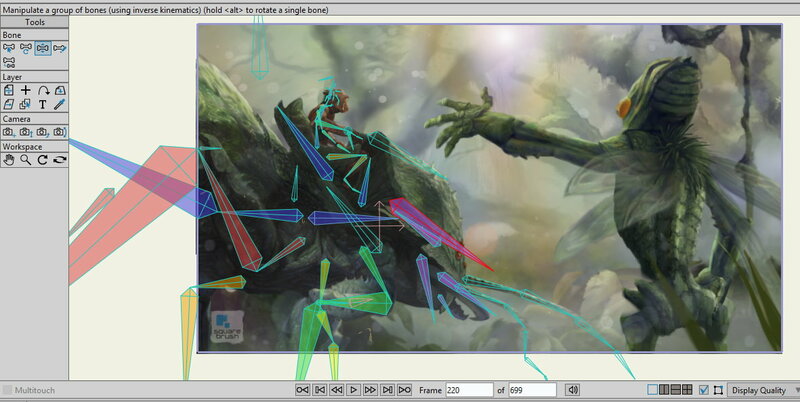 Personally I find CTA3 the ideal animation tool for producing animation quickly with a team of one (i.e. just me). If you're planning on creating an animated web series then CTA3 is going to save you a lot of time and allow you to focus more on telling the story. As I said at the outset I believe in Moho as a tool that can produce TV quality animation. It's advanced character rigging allows for extremely complex, multi-angle rigs. If you need proof, Moho Pro 12 is the backbone animation tool of the acclaimed children's TV show Puffin Rock created by Cartoon Saloon. It is used to create all the animation and character rigs of the show (which you can read about in detail on SmithMicro's Blog). Watch the video below of Jeremy Purcell, Assistant Director of Puffin Rock demonstrating the lead character's rig and animation. Moho's advanced drawing tools means it's also possible to use it in the creation of final artwork for backgrounds and props. You really only need additional drawing software to plan and create your initial designs for importing and tracing as vectors inside Moho. Overall, Moho Pro is a much more powerful application with features to rival higher end animation tools at a more affordable price for anyone to use, professional or otherwise. The latest version includes features I've not mentioned here, simply because I've yet to learn or even come across them in the software's video tutorial series. (Mesh warping animation is one such new feature that springs to mind). There in lies the difference between CTA3 and Moho Pro 12. 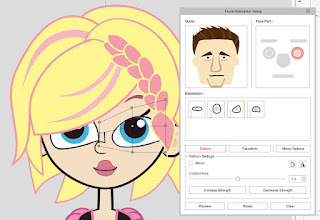 CTA 3 is easier to learn and will have you animating your own creations much sooner. You'll master the majority of the program much quicker and find it easier to retain how to use even those features you don't use a lot in your work. Moho Pro 12 is packed full of features, is extremely flexible but at the cost of being much harder and more time consuming to learn. You'll spend a lot of time relearning how things are done before you get to any kind of proficiency with the software (speaking from personal experience here). It'll handle anything that CTA3 can do and more but the set up will be a little longer and more involved. You can certainly use it for creating animations quickly but if speed is an issue CTA3 may have the edge. The good thing about both of these application is the affordable price. It's not impossible to have both in your toolbox and use whichever one is really suited to your current project (as noted at the top of this article I've had the latest versions of both for years). If you're new to animation software, and just want to get up and running quickly, start out with CTA3. It's feature set is deep enough that you're not going to out grow or feel limited by what it can do in the short to medium term. 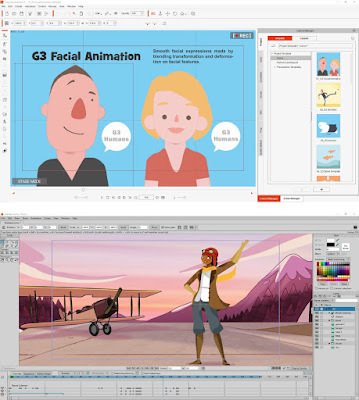 It's an ideal tool if you're short on time but still want to produce quality, puppet style, 2D animation or animated explainer videos using motion graphics etc. If you're not as thrown by a steep learning curve and need more flexibility and visual design choices than CTA3 has to offer, Moho is worth the time you'll need to learn it. It's a much bigger tool box that will give you many more options for experimentation with visual style. An advanced animation tool that, once you know it well, you may never want to use anything else (if you haven't given up on learning it... can you tell I'm struggling sticking with it even though I believe in the application?). Hopefully I've given you something to think about in making your own decision. The applications themselves are in two different places. Moho is a more mature program at version 12 where as CTA3 is still evolving to catch up in features. CTA3 has some way to go but where it is now makes it a formidable animation studio that can certainly handle most of your 2D animation needs. - Post supported by Reallusion. Great review! I feel much more confident that CTA3 is the program for me. I love the work JFiles does with Moho though. I have scene some really beautiful looking animations from Moho. Thanks David! Thanks for this. I've played with both demos, and being a one man band, CTA3 seems like the simpler option, with good results. I like Moho as well, and it's not out of the question to have both. Very helpful review, thank you! Crazytalk is crap and meant for people with no animation or art skills. Moho has the capabilities to create real animations in any style whether its toony, anime, cut out, etc... Plus the animation tools are a lot more fluid and powerful as well. Crazytalk will always be the noob tool for people who want to try easy crappy quality 2D animation. Honestly the owl example is terrible and shows the person needs to work more on character design and animation in general. You shouldn't waste your time writing anonymously. It devalues your opinion because it shows you're not prepared to stand by what you're saying. No spine. David that was very helpful review. As a former Disney artist who spent his career around Toon Boom well over a decade ago, the idea of having alternate platforms for digital production was limited to Flash which was re-engineering at best. I looked at both programs and went with CTA3, primarily for the reasons you gave here - perfect for a one-man-band and quick to pick up. In CTA3's defence, I see it as all programs - a blank canvas; something you can use to develop your own work. Given time and the willingness of other artists to dig deep and push the program, I think CTA3 will develop into a very useful professional tool. It will rely on input from artists like ourselves to help make it stronger, but I see that level of interaction as perfect for making a tool that is relevant, because the artists have shaped it that way themselves. Glad you found my review useful Kris. I feel the same way about most software applications as you do, any of them can produce great results if you're willing to really dive in and discover everything they have to offer as a tool. CTA is still evolving with version 3 bringing in some new features that professional animators, such as yourself, can appreciate. It's still missing a few though (such as onion skinning) but what it has can really speed up your work flow when working as a solo creator. If you haven't, check out some of Garry Pye's work with CTA3. He's really making the platform shine with his work. Thanks David, for such a comprehensive review. I too, think CTA3 is a perfect companion for one-man band. I am just a Hobbyist animator. The learning curve of CTA is very fast. Personally, I liked the facial puppeteering and advanced facial editor. The motion library too, is very helpful for beginners to get started and get inspired by the programs ability. The bone tool in CTA is very simplified– not as advanced and intricate as MOHO12. The bone influence parameter may quite intimidate the beginners. CTA has a well structured engine for animation. In other softwares like Toon Boom Harmony and MOHO12, we have to construct a system– particularly all the visual selectors. In CTA, just following their template, we can construct our own powerful, well rigged characters. But again, MOHO and Toon Boom Harmony has got their own strengths, which keeps them on the forefront. Thanks, once again. Have a Blessed day !!! Thank you for your thoughts Sanjay. I'm sure other visitors to this post will find them useful when deciding which software is right for them. I think one of CTA's strengths is its simplified systems, great for if you need to produce animation quickly. Whilst Moho and Toon Boom have many more features you can still get very professional results from CTA. Great to hear you found this post useful. CTA3 does have a little bit of a learning curve but the basics can be picked up fairly quickly. Feel free to reach out if you run into any trouble learning the software. I'd especially recommend reaching out to CTA3 Content Creator Garry Pye. This link will take you to his Facebook page where you can contact him for hints, tips, and the occasional free content. He's very active in the community and produces some of the best content for CTA3 you'll find. Thank you David. As per your suggestion I already liked Gary Pie's Facebook page and just subscribed to your newsletter becauise this blog sounds like very very interesting. Congratulations I will be here often. Unfortunately I have to modify my opinion on CTA3 because of their unexisting customer support. I downloaded the trial version and encountered an issue (system crash) doing a series of operations so I sent to support a video clip of the errors + the crash log file and all information they required me. I kindly asked them to reply me with any news (good or bad) before my trial period expire so that I can buy the software (pipeline version) with the biggest package. Then I did practice with the software and, after a few days playing with it, I was pretty sure to buy it because, apart that crash, it worked fine and it is extremely easy to use. But customer support never replied me. I sent them 3 more messages (the last one yesterday) but they totally ignored me. So I uninstalled all Reallusion software incuding the hub and asked them to delete my account on their website. I cannot pay about 500 € now (I was planning to buy software + the biggest package + some more other characters) and many more in the future to a company who ignores its customers. I am sorry to say so, I am definitely not an 'hater' or someone who usually speak badly about others but now I really feel upset because of this behaviour of Reallusion customer support. I will switch to Moho. I've never had anything but good experiences with their customer support. They'll usually go above and beyond my expectations to try and solve a problem. For example I once had an issue with character creation and they sent back an entire step by step PDF file outlining the issue and providing a solution. I do know that if you contact their customer support over a weekend it's unlikely you'll get a response anytime before the next business day as they don't offer 24/7 support. You also need to give them time to actually look into the problem. Personally I wouldn't discount a great piece of software simply because of poor customer support. Which, again, I'll say I've never had anything but great customer support from Reallusion - you just have to give them time usually. I'd recommend giving them more time. Whilst you're waiting you could download a completely free special edition version of their software that Reallusion is making available to anyone as part of their Animation@Work competition. [ This link ] will take you straight to the download page where you'll also find great deals on the software. Check out the competition whilst you're there. You have until July 20 to enter a 1 minute or more animation for a chance at $2000 cash prize. Hi, I'm CTA3 users, every CTA3 users are precious, don't be easy give up, how can I help to solve your issue, I will pass to RL technical support and they will help you or you can go to their forum and post your issue, there are a lot of power developer could help you. thanks for the review! i originally animated with Flash back in the day, and i'm glad there are so many more choices nowadays. this is an old blog but i would love to comment as i really love animated cartoon and Animation i my self am a Animator i love to learn new tricks, i like your blog / review. Really informative, thanks a lot. I didn't consider Moho till I read this. I'm not an animator, but working on small game, and would like to add animation tool to my arsenal. Since it's Black Friday, I am considering buying one now. I tried Spine a bit while ago. Do you have any experience with it? How does it fair against these two? I heard it's one of the best for 2D games. I looked at both of these programs and messed around with the demo versions. I ended up going with Moho because Crazytalk Animator was confusing with different character types, G1, G2, G3, with some features available in some generations but not others. Also, creating your own original characters was difficult if not impossible, especially the G2 characters that have the full 360 turnaround. I liked how with Moho you can build a very simple character, or a very complex rig with head turns and body turns and perspective. For me, it wasn't even close. Moho was easily the better program. Para animaciones sencillas y rápidas es mas fácil crazytalk animator esto es si se usa personajes que vienen con el programa o comprados,personajes propios no se pueden crear sin depender de otros programas. Si se busca calidad en animación es mejor moho y los personajes se puede crear en el mismo programa. Thanks David, well written and so far. 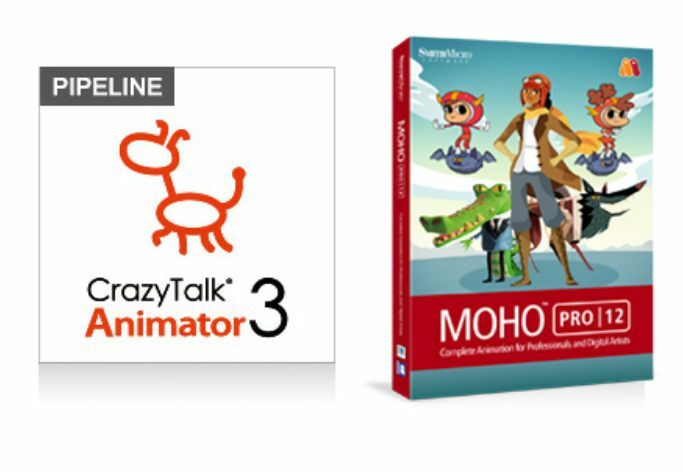 I've been using CrazyTalk Animator 2 Pro and also older version of Anime Studio (MoHo). My experience so far does not differ from yours. Now I have some more animation to do. So I've been wondering which software to update. It seems that in 2019 situation didn't change much. MoHo is still best option for well trained animators and animation studios that look for best quality. CTA (now also changing name to Cartoon Animator 4) is great for those who want acceptable results with as little work as possible. But I wonder if there is any better option that CTA out there.